Our absolutely No. 1 bestseller! 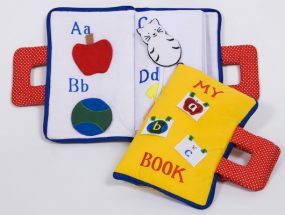 This colourful fabric playbook really does keep them quiet! With 10 pages of learning skills it all zips up to carry around and is a perfect gift to send in the post, especially overseas. Also brilliant for taking in the car, to lunch with friends, or round at Grandma’s when you visit! Unfortunately this item is Out of Stock until September 2018. 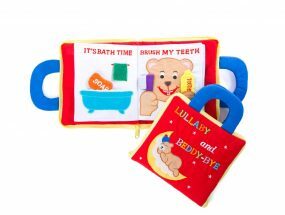 This fabric Playbook is packed with things to do and learn with pages full of activities such as such as Name and Match the Colours, Button the Flower, Match the shapes, Count the Teddies, Unzip the Zip etc. Perfect from 18 months up until about 3 or 4 years – and something you will want to keep for the next generation. 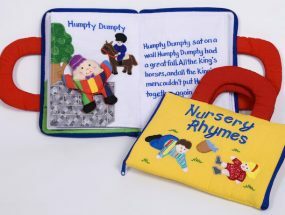 The fabric pages are all machine embroidered to give it that handmade feel – which indeed it is.